Reduce your risk around holiday decorations. It's a little early for me to be decorating our home for the December holidays, but others have already started. As you pull out the decorations, ask yourself a couple of questions: How old are those holiday lights you're stringing along the roof line? You're using hooks rather than a staple gun, right? Are your extension cords rated for outdoor use? The number of accidents connected with ladders and stringing outdoor lights is high. 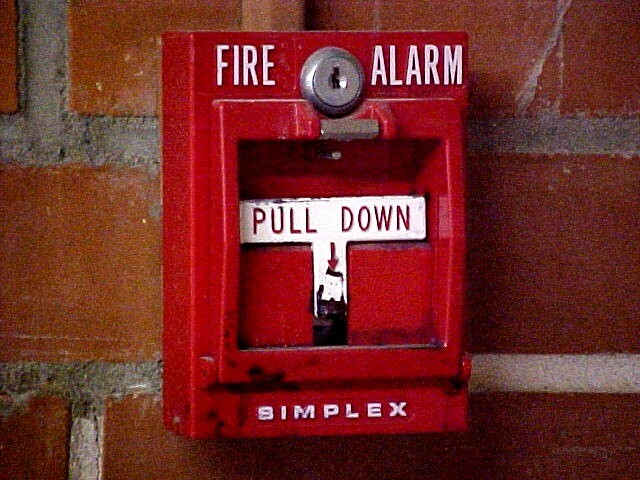 With a few reasonable precautions, you can significantly reduce your risk of fire or calling 911 for an ambulance. For a good checklist that covers both inside and outside holiday decorating, print out this brochure from the Consumer Product Safety Commission.. The risk of too much. We've just moved into the holiday season. The media encourages our sense of frenzy, of wanting to purchase things, as if things make us happy. We make long lists, against the backdrop of a story about gifts brought to a baby in a manger. If we're not careful, incorporating festivities into our regularly hectic schedules often results in a higher level of personal risk and safety. We're seeing more studies now on the costs of multitasking without respite. So it's worth it to make a new set of resolutions for this holiday season. Slow down. Simplify. Practice acts of kindness. Worry less about gifts and more about being grateful for what you have. Know that others care for you because of yourself and your innate gifts. Most of all, as we move into the darkest time of the year when the sun is furthest from the earth, find the light and joy within yourself. For more information on the book and the first six reviews, and to decide if you'd like to purchase the book, just click the link on the right hand side of this page. If you're in Seattle on December 1, please consider joining us for the book's holiday launch party. Drop me a note and I'll send you details on the event, where we'll be selling the book at a reduced rate and I'll be glad to autograph your copy. We think the book is perfect for a stocking stuffer for the upcoming holiday. This book proof arrived less than 2 hours after I wrote the entry below. It used to be that when you had a manuscript ready, you hired an agent to sell it to Harcourt Brace or Random House. You waited 18-24 months to see the book appear, and these days you would have covered a lot of the costs of publishing the book as well. This route appears to be a crumbling model. It used to be that self-publishing was looked upon as vanity publishing designed for miniscule audiences. Lucky for all of us that things have changed radically as the business of publishing and selling books has evolved. I did not want to wait 18-24 months and so I've chosen this new model. I'm publishing this book via createspace.com, a service of Amazon. So far the experience has been clean as a whistle. Services that I'm using from createspace will include options to sell the book from my own e-store (now live on this site), or via Amazon, or via extended book distribution. 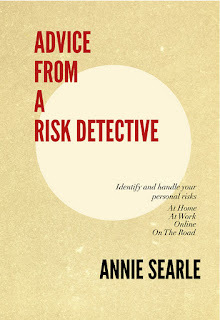 My book will also be converted to a kindle version option over the next couple of months. Best of all, the printing is done "on demand," with books shipped within 48 hours of an online order. I meant this book to be read by both professionals and the general public. There is not a single acronym in the book. 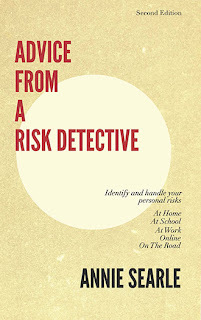 So for me the challenge (the risk) is to market the book as well as a big publishing house. We'll give it our best shot. I flew to Las Vegas last Saturday, to the 59th Annual International Association of Emergency Management (IAEM) conference. That evening, in an inaugural event, 20 women were inducted into the Hall of Fame for Women in Homeland Security and Emergency Management. There are 14 of us shown in the photo below, all of us standing on the shoulders of those who preceded us -- women like Eleanor Roosevelt (first Civil Defense Assistant Director), the founders of The Salvation Army (represented by the sole gentleman in the photo) or the Save the Children Fund. Leaders from local, state and federal government, volunteer, faith and community-based organizations, private and nonprofit sectors, academia and the military joined conference attendees as the awards were presented. An informal version of the formal photo of honorees. I was inducted as the "first female emergency management leader in the private sector." Because of the award, I've met women I'll never forget, and am especially grateful for the additional leverage this gives me to mentor women still rising through the ranks. Here's a photo of the award itself. Amber flame on clear glass inscribed base, roughly 15" high. All of which causes me to say once again, "You always get back more than you give." 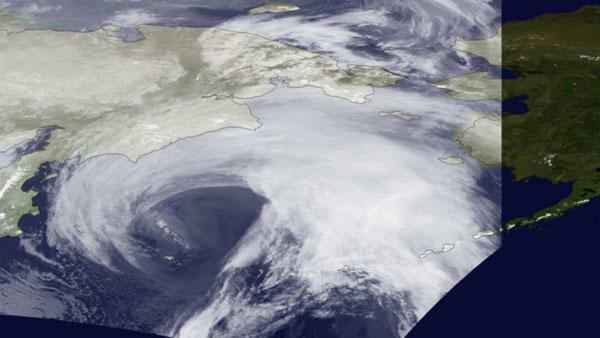 This NOAA image shows us the Alaska storm about 20 hours ago. Its ferocity can act as a reminder for those of us in the lower United States to start now to prepare for what Mother Nature will throw at us this winter. Is your emergency kit refilled from the last time you used it? 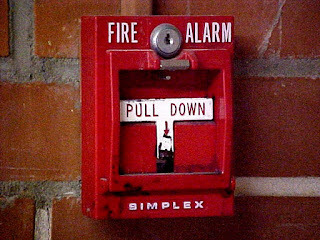 Is your emergency plan known to other members of your family? What else might be sensible to do to get ready for a harsh winter? Low solar activity is also a primary driver of atmospheric cycles that influence blocking activity patterns/ridges. Our weather models consider all of these factors and are currently showing a particularly harsh winter for many parts of the US during 2011-2012. Large parts of Central and North America will face below average temperatures with above average snowfall throughout this winter, with temperatures in many Eastern and Western parts also showing as below average with above average snowfall amounts. We expect the Pacific Northwest region to experience a very severe winter and the Cascades snowpack is likely to see increased levels due to the negative (cold) phase of PDO. Our weather models are also showing an increased likelihood for major snow events in Northeastern and Midwestern parts of the US throughout December 2011 and January 2012, that could see severe blizzard conditions hit New York City and Chicago. With low solar activity levels...and the general trend for a much colder winter after the onset of last year’s La Niña, this winter could prove to be a record breaker with extremely cold temperatures and exceptional levels of snow for many parts of the US. Many residents of Connecticut are still without power after the early winter East Coast storm. You can't assume that grocery stores or gas stations or ATMs will be working after large storms or other catastrophic events like hurricanes or earthquakes. Even though it may have to be modified as events unfold, having a well-organized plan and supplies is always better than being unprepared. It's a term used generally to describe services rendered for the public good voluntarily, without payment. I've tried over the years to offer pro bono services in areas where various areas of my expertise could be put to work. For some years, my technology background came in handy as a board member at NPower Seattle, which offers technology training to non profit organizations. I drew upon my liberal arts background as a member of the Washington Commission for the Humanities. At the Seattle Public Library Foundation, I use my leadership experience as well as those two areas in the decisions we make as a board of directors. I agreed this summer to step in on an interim basis and lead the Washington State financial services coalition that I helped found in 2003 so that we could develop the next generation of leaders. My agreement was contingent upon having a co-chair presently in the industry, and I was lucky enough to recruit Shelby Edwards. I also agreed to help lead our neighborhood disaster preparedness team to increase the number of families participating. There are 300+ homes and 17 coordinators for our neighborhood. Being part of this effort helped me better describe in Advice From A Risk Detective how neighborhoods anywhere can organize themselves. Don't wait until you retire. Make time for a cause you care about now, and work it into your schedule. As is the case with most pro bono efforts, you'll get back more than you give. 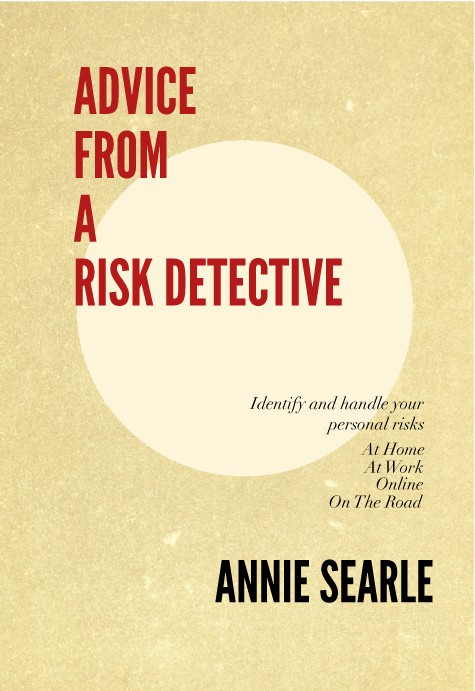 "As I think about it, Annie, I'd recommend that you not send the book to be published until you are able to give it a good final read and have confidence in it. The book does have your name on it, after all. And down the road, a bit more of delay now will pale compared with un-fixed problems in the printed versions." Molly worked with Lauren and I on content and its management for the ASA website. She knows not only my voice but also my high standards. Here she is reminding me about my integrity as well. Who could ask for more in an editor?